Public Art coming soon to the Boulder Creek Trail along the Arapahoe Underpass! The Boulder Office of Arts + Culture is seeking an artist, or artist team, for a site-specific public art commission to compliment the enhanced Boulder Creek Path: Arapahoe Underpass at 13th Street. This enhanced underpass and confluence point is just one area of the 5.5-mile multi-use Boulder Creek Path in central Boulder, Colorado. 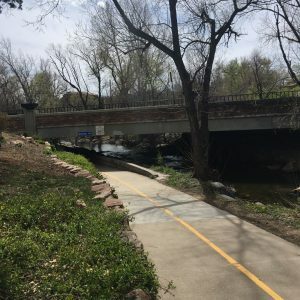 Possible locations and themes for the Boulder Creek Path Arapahoe Underpass have been identified, with particular interest in the retaining walls of the underpass. Additional locations may include the 5-points pedestrian confluence just south of the underpass and the on-street crossing at 13th and Arapahoe. 3D work will not be considered for these locations, however a variety of 2D works and low-relief works will be considered (including murals, mosaics, sound, etc. ), as all sites are contained within the floodplain.